Crazy Legs are an essential jig and fly tying material. They add movement and a splash of color to your flies and jigs. They also make them more realistic when you tie shrimp, crab, and crawfish imitations. 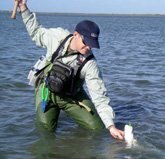 Legs are featured in several of the top bonefish, bass, and saltwater flies. It was a no brainer to include them in our new Buggs Bonefish Collection of jigs. Here you'll learn more about them and how to incorporate them into your flies and jigs. Crazy Legs are made of silicone, and are lighter and finer than the standard rubber legs. They are easy to work with, even with smaller flies and jigs. To incorporate them into your favorite pattern, just tie them in where you need legs, movement, color, or all three! Speaking of color, one look at the picture below and you'll see what I'm talking about. They all have one or more color of contrasting flake in the legs, and then you have the Hot Tip versions. Read on to learn about more of the well known patterns that use them. The first pattern I saw with legs was Del Brown's Merkin Crab. It makes sense that the most famous crab pattern of all time would include them, because legs are prominent on crabs. Now virtually all crab patterns use legs. Pop's Bonfish Bitters is another famous crab pattern with legs. Our own Bitty Bugg, drawing inspiration from these two patterns, includes legs. The easiest way to include them in crab patterns is to tie them on top of the hook shank, extending to each side. Two, three, or even four sets of legs can be tied in between the other body materials of your crab. When you tie them in, make some tight thread wraps to secure them. Thicker thread works best so you don't cut into the legs. 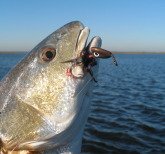 Crazy Legs also make good additions to shrimp and crawfish imitations, as well as the more impressionistic bonefish flies and jigs. Beck's Sili Legs is a popular bonefish fly that utilizes the Hot Tip Crazy Legs. Several other top bonefish flies that imitate spawning shrimp and mantis shrimp include these legs. Our Loco Buggs and Hot Head Shrimp Buggs use them as well. The difference in tying legs into a shrimp imitation is that you have them point toward the head of the fly or jig and tie them in on the bottom. Anatomically, shrimp have a different shape than crabs. Their legs extend from the bottom and their mouthparts come out from the head. When fleeing, everything is streamlined and they swim backwards in a darting motion. That's why the majority of shrimp flies and jigs have legs that point back from the head or from underneath. So there's kind of a science to the placement of the legs. But they also make your jigs and flies look really cool! All of our Buggs are tied with bunny because of the incredible action. They look alive even when sitting still. Add in the color, movement, and realistic effects of Crazy Legs and you're in business! It's like sprinkles on ice cream! Next time you're at your vice, break them out and tie them in. I know you'll be glad you did. The link below will take you to the store where you can check out our huge selection, and the same ones we use on our Buggs. Head to the Online Store to find a huge selection of Crazy Legs! We concentrated on saltwater flies and jigs on this page, but you and I both know about crawfish. They're a major food source for bass everywhere. Crawfish are built similarly to a shrimp, and when they're trying to escape a predator they swim the same way. Top crawfish imitations all include crazy legs. And we also know what a bass fisherman's favorite jigs all have around their necks - silicone skirts! 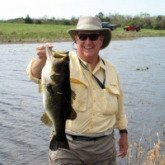 So using legs on your favorite bass jigs and flies makes sense as well, and I hope you'll give them a shot. Remember, whenever you need movement, color, and realism, think Crazy Legs!